I am so happy to have the opportunity to work with Front Row Shop, who sent me some basics to review. This long-sleeve navy t-shirt is just what I’ve been looking for to add to my weekend wardrobe. It is extremely soft and sheer, so perfect for layering, and it has thumb holes. I used to think thumb holes were strange and annoying, but I’ve ordered a couple tops from Ellie for working out that have them, and after wearing those, I now love thumb holes! I simply roll up the ends of the sleeves when I don’t want to use the thumb holes. I love how this outfit came together. I love the mix of blue and leopard, so I thought it would look good against navy as well. I added an olive green vest, cognac boots and new purse (thank you to my boyfriend who bought it for me after I showed him Jacy’s blog and how much I loved her purse… he’s a smart guy) and was ready for a comfy weekend day. P.S. sorry about the random cars in the background. We are still trying to find the best places to take outfit photos around our new apartment area! I love the mix of neutrals in this look! That scarf was the perfect topper! This is such a great casual, chic look! 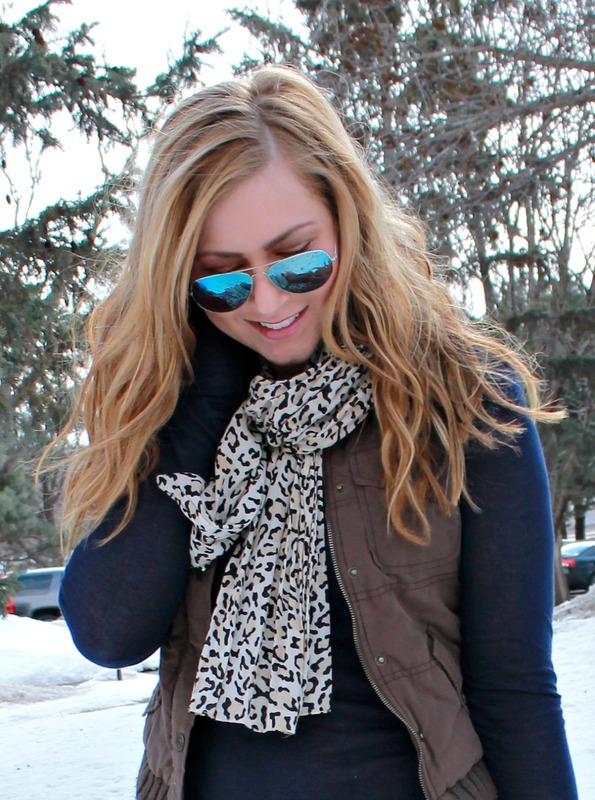 I love the leopard scarf. And your tee looks so cozy. Super cute look for the weekend – I never look that good on the weekends! I really love your leopard scarf! The tee does look so soft and cozy, sometimes I forget how important it is to have these great basics in my closet. Then you can add layers and create a look. I usually do the same thing! I always want to buy pretty or very unique things, but then when it comes to putting together an outfit, I always seem to be low on tanks, t-shirts and other pieces for layering to get the right look! I love each & every piece of this combo Rachel. The NB top really served as the perfect palette & the blue mirroreds are the icing on the cake!!! Love the aviators and that bag is sooo great! Very cute! I really love the vest, and your hair is getting so golden and pretty. The thumb holes are genius! I wish I had had those all winter! And that bag is awesome! Great mirror aviators & scarf. Such a great casual layered look for cold days. =) I am pinning this. Definitely a great casual look and I love this blue on you. You look so cozy, great winter outfit. Of course I love the leopard scarf. Great bag!! I need a new one for spring. I just may head over to The Limited. You look incredible. 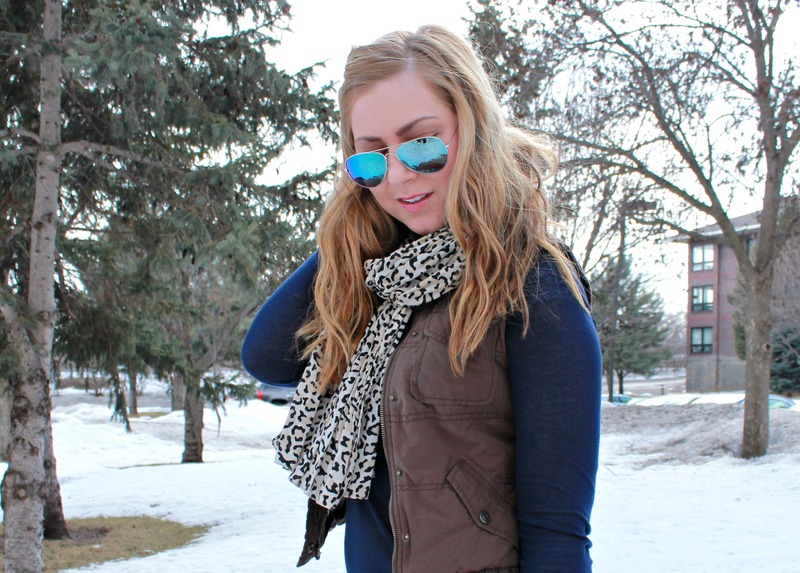 I love your leopard scarf and sunnies. I have come to love tops with thumb holes too- especially in this winter that won’t seem to stop already! They are really nice for workout gear like you mentioned…my fave! 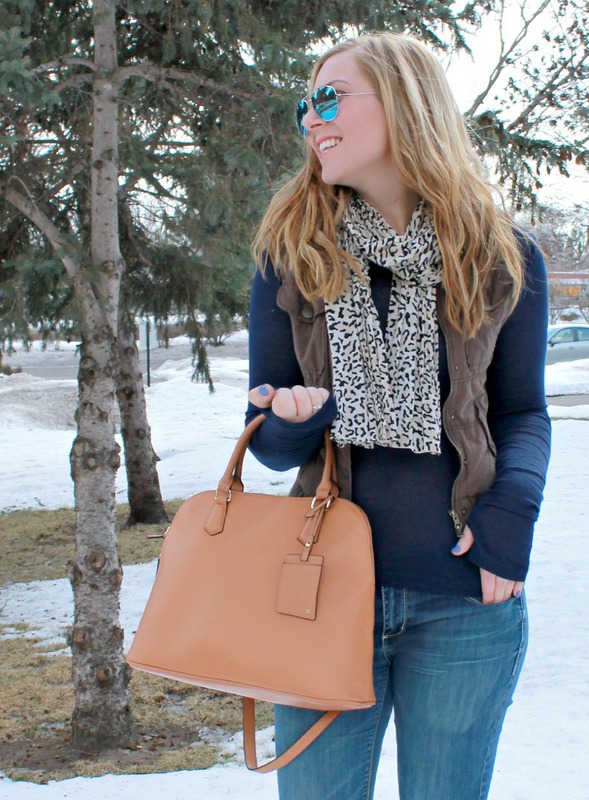 I love the neutrals in this look with the pop of leopard on top! Super casual but still super cute! I can’t wait to see you next week! I am sooo excited about it! Well shoot. You just reminded me that I need mirrored sunnies! they look fab on you! And this outfit is really great! As much as I hate anything cold weather related – I still very much dig this outfit! 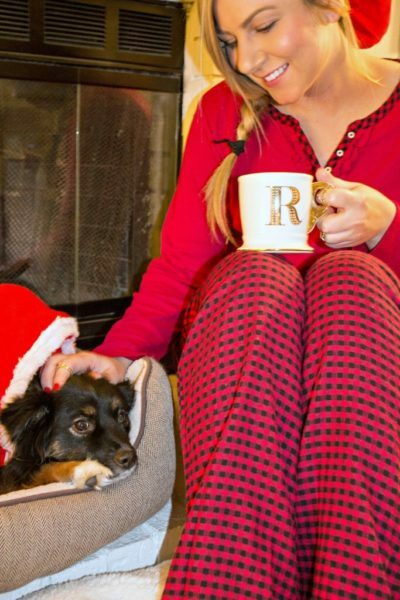 You look so cute and cozy! I love your bag! It is such a Californian look, too bad about the snow, great combo! Thanks for linking up with Beautiful You! HUGE fan of thumb holes but I don’t own any real shirts with them, only workout gear. Love that navy top! Love the bag! Such a great look!